“My doctor, my neighbour, my accountant, the cabbies, half the world around me is Indian in London and now I am in India to recover some of the money that I pay to Indians back there," joked Jeff Innocent, who performed in Mumbai as part of the Comedy Store’s promotional tour in India a fortnight ago. The 100-odd people sitting rather grimly at the beginning of the show now roared with laughter. The Comedy Store is set to open in Mumbai on 14 January 2010. 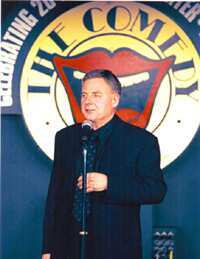 Don Ward, the producer and CEO of the Comedy Store talked to ‘Lounge’ about the success story of this famous stand-up comedy shop and Indian comedians. Edited excerpts. Why did you choose Mumbai as the first city outside UK to take comedy store to? What potential does the city have? How do you plan to pull crowds away from Friday night shows of Hindi movies? We don’t wish to stop you from going to movies. Bollywood is quite funny, every one sings and dances. We will also make some song n dance of it. We will not get in the way of Bollywood; we will embrace Bollywood and add another dimension of entertainment to India. I don’t see it as competition at all. I see it as an alternative to Bollywood and for a night out. People will be addicted to comedy. Especially when we find funny local comedians. Stand-up comedy in India is still a somewhat new. How long will it take to become a household name? At our promotion shows I noticed the audience laughed instantly, they found us funny. However it will take some time to become a household name. It will have to go slowly. Bollywood is an old industry. We are just starting. But once we get going you just see how quickly the Comedy Store becomes popular. If fact we would also like to produce in Hindi. I’d like to see ‘The Hindi Comedy Store.’ It sounds exciting. You have not scheduled any Indian comedians so far. It’s just the opposite. On my opening night I will actually have an Indian who works regularly at London and Manchester Comedy Stores, Dr Sinha. Also, since I will be presenting comedy on a regular basis there will be three international comedians from Thursday to Sunday, but from Monday to Wednesday, I will be handing the mike to anyone and everyone in Mumbai who wants to come and try and be a comedian. On Saturday there will be a master class with the international comedians to groom Indian comedians. In an interview you said that Indian comedy is akin to British comedy. In what way is it so? Yes, it is extremely similar. I firmly believe that the British ruled you for 200 years and before you kicked us out we gave you some wonderful things: we left you with beautiful Victorian buildings. We have nothing in the UK to match these constructions. We left you with a wonderful language. If you hadn’t had English you wouldn’t be where you are because English is the international trading language. And the last thing we left you with is a good sense of humour. But you should have kept us another 25 years, let us finish the roads and then kicked us out. Were there any instances of heckling when you first came on a tour here? Yes, we have had one or two instances of heckling, but incoherent heckled. It didn’t really mean anything. We haven’t heckled heckled yet. But we are hoping that in the future the audience realizes the interaction that can happen but we don’t want to much interaction because that will spoil the show. But a good heckle that’s something. What are some of the themes the comedians will target? Comedy Store is not about the old structured sexist and racist jokes. The great worth of comedy today is observational comedy. And this is what all my comedians are. They review the funny foibles of things that happen to you and to me and in our normal way of life and present it verbally. Nothing is funnier than realism. Any plans for a comedy festival in India? I am happy to talk about a comedy festival. I would be happy to sit down with the Mumbai city council and say ‘I will pull up a festival for you, will u sponsor us’? We would like to be a part of the fabric of Mumbai. So when people think of Movies they think of PVR and when people think of comedy they think of the comedy Store. That’s our objective.